I love scones! They are one of my favorite breakfast pastries, second only to perfect buttery croissants. A good scone should be buttery and most of all fluffy and moist on the inside. Unfortunately, there are a LOT of dry scones out there. If you are thinking “Pffff, scones…”, because you have had the misfortune of coming across nothing but disappointingly dry and tasteless specimens so far, you should definitely give this recipe a try. 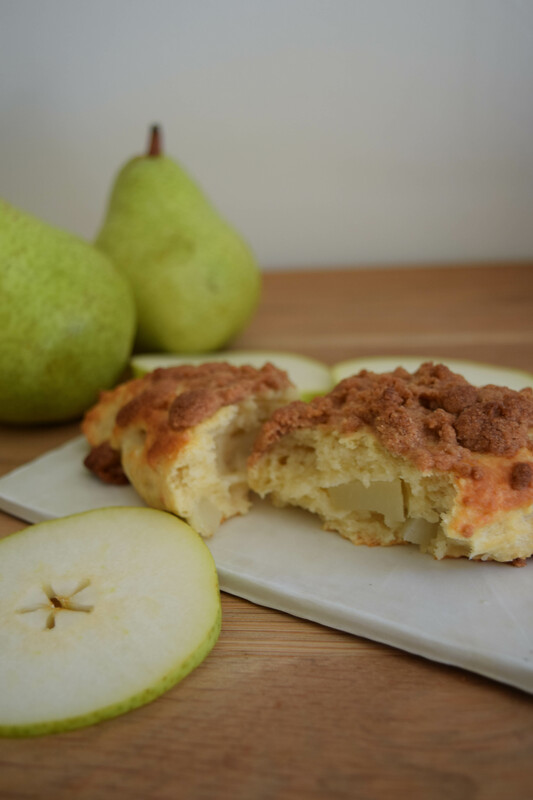 Tip: Due to the chunks of pear, the scones should stay nice and moist for a couple of days, but the crumble may get a little soft. If that’s the case, simply pop them in the oven for a couple of minutes at 450°F and they will be (almost) good as new. In a medium sized bowl, mix all of the crumble ingredients until well combined. They should form a rather solid dough that can easily be broken up into smaller crumbles with your fingers. Cover and place in the fridge until you are ready to bake the scones. Wash and dry the pear, remove the core and skin, and cut it into small to medium size chunks. In a large bowl, combine the flour, baking powder, sugar, salt, and butter. Using your hands, incorporate the butter until the mixture has a coarse, crumbly consistency. Add the buttermilk, vanilla extract, and pear. Using a large spoon or spatula, gently mix until the dough clumps together in a large ball. Don’t worry if you still see dry bits of flour here and there, but be careful not to overmix the dough. Transfer the dough to a floured work surface. Sprinkle with flour. Using your hands, gently press the dough into a disc shape with a diameter of about 10 inches. Cut the disc into eight triangles and transfer them to a baking sheet lined with parchment paper, leaving a space of about one each between them. Gently brush the top and sides of each scone with milk. Evenly distribute the crumbles over the scones. Bake at 400°F for about 17-20 minutes, until the edges are golden brown.